In the tradition of Alex Garland’s The Beach, a spine-tingling adventure novel about a group of friends whose journey around the world on a yacht turns from a trip to paradise into a chilling nightmare when one of them disappears at sea. And a disappearance-at-sea that turns paradise into a chilling nightmare. Lana and her best friend Kitty leave home looking for freedom—and that’s exactly what they find when they are invited onto The Blue, a fifty-foot yacht making its way from the Philippines to New Zealand. The crew is made up of a group of young travellers bitten by wanderlust, and it doesn’t take long for Lana and Kitty’s dream of sea-bound romance to turn into reality. Both women fall under the hypnotic spell of The Blue, spending their days exploring remote islands and their rum-filled nights relaxing on deck beneath the stars. But when one of their friends disappears overboard after an argument with another crewmember, the dark secrets that brought each of them aboard start to unravel. I've had to decline a few review requests over the past couple months because I've been so behind in my reading. When I received an email from the Simon & Schuster Canada team about reviewing The Blue, three things popped out at me: New Zealand (I love the Hobbit and all things LoTR), the Philippines (where my parents are from) and its genre - a psychological thriller. There was no way I was turning down the opportunity to read it. The story begins with two best friends who have had enough with their life in London and decide to travel the world. They grab a globe to choose a random location and land on the Philippines. Lana and Kitty embark on their adventure living day to day on the islands. During one of their day trips they come across a crew that lives their life on a yacht called, The Blue. Lana and Kitty join the crew and live a carefree life until a turn of events leads to a crew member missing and each person's deepest secrets revealed. The Blue was a fantastic book. It was beautifully descriptive and had perfect details about each of the settings. The suspense carried throughout the book especially as it skipped between the past and present, often leaving you hanging and wanting more. As much as I enjoy psychological thrillers, I always find it so difficult to review them because I do my best to keep my posts spoiler free. The Blue had so many plot twists and unexpected turns. I will say that I normally come close or hit it bang on when it comes to twisty endings, but this one totally fooled me. I recommend this book to those who enjoy a great suspense. mystery, or thriller novel. It will definitely keep you on your toes. 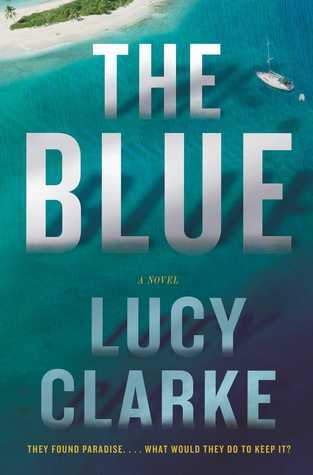 Prior to reading The Blue I had never heard of Lucy Clarke or any of her previous work. After finishing this book, I looked into some of Lucy Clarke's other books and the Sea Sisters definitely looks like something I would enjoy. I really hope to get to it... one day. This is one huge reason why I love being part of the book blogger community. It gives me so many wonderful opportunities to meet amazing people and discover my next favourite book. Question to my blogger friends and readers: Which books/authors have you discovered over the months/years that have unexpectedly become one of your favourites? In accordance with what you have written so far, I would like to admit that this book is worthy a read. The novel is marvelous!